Painting ranks among the most engaging and lucrative hobbies. This can be attributed to the fact that it not only allows you to be creative and spruce your home in a way that you have always desired but it also saves you a lot of cash. You can easily transform your home interiors in a matter of hours and have great fun while at it. Whole house interior painting and decoration need to be handled in the most professional manner. One of the essential tools that will always come in handy is the best paint sprayer. This is a mechanical device that helps you coat a large surface with a protective coating, mostly paint coating, quickly and in an even manner. These paint sprayers work perfectly on different surfaces. This means that you can use them on wood, masonry, metal and brick. The wide range of use gives them the much needed versatility and makes them a perfect fit for any household project. If you’re a first time spray gun user, you would definitely do well and finish well using a Fuji 2202 Semi-PRO 2 HVLP Spray System, one of Fuji’s spray guns specifically designed for DIYers who want a professional output for their paint job projects. The item weighs 26.1 pounds with dimensions of 16 x 9.5 x 12.5 inches, and comes with a 25-ft hose. It not only carries a trusted name in the spray gun manufacturing industry but also offers great features at a fairly affordable price making it the ideal DIY spray gun. Fuji 2202 Semi-PRO 2 HVLP Spray System offers a lot of great benefits and advantages. Owing to the sprayer’s high volume, low pressure (HVLP) spray system, Fuji 2202 Semi-PRO 2 spray gun allows users to save time, money and material. It operates with high transfer efficiency so it produces less overspray and more of your material ends up on the surface than in the air. It works with high delivery rate so you can cover a large surface in less time. HVLP spray guns, in general, are known for the fine and smooth finish they are able to produce, especially if the sprayer has the proper settings and the right ratio of pressure and air volume. The Fuji 2202 Semi-PRO 2 is engineered as a light weight spray gun with a convenient handle that allows the user to move and carry it with great ease. 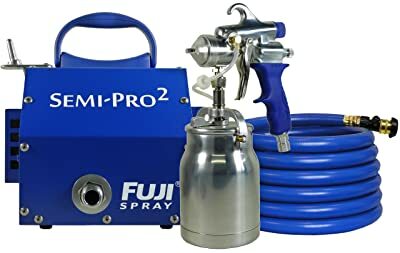 Fuji 2202 Semi-PRO 2 HVLP Spray System is packed with great features that are definitely worth more than the sprayer actually costs. Thus, you get not just value for your money but also highly satisfying results. Users of Fuji 2202 Semi-PRO 2 HVLP Spray System may encounter some performance issues when working with thick paints or materials, which can be one of its limitations. Other than that, the Fuji 2202 Semi-PRO 2 HVLP Spray System remains a good choice and a top contender among HVLP sprayers. The spray gun has a professional non-bleed type of functioning. It has an adjustable pattern fan control that lets its users choose their desired spray pattern. The metal turbine case with a handy gun holder makes it easy for the user to move and carry the unit. 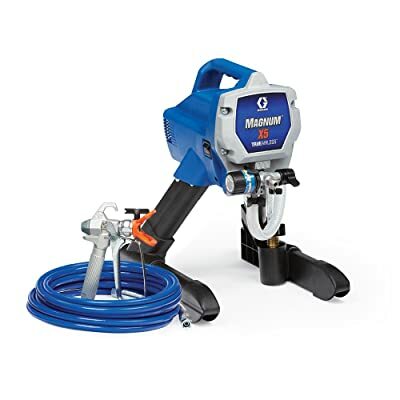 The 25-ft hose with quick connect coupler and which includes air control valve, helps reduce overspray, and increase transfer efficiency. It also allows the user to reach and cover high and wide surfaces. The 1400 watt 2-stage bypass motor allows the user to handle a wide range of coating as may be required by or appropriate for the surface. First time DIYers who want a professional quality output for their paint projects would definitely be on right track working with Fuji 2202 Semi-PRO 2 HVLP Spray System. For an affordable price, you can enjoy all the great features that make for a trustworthy and reliable paint sprayer that can meet your paint job requirements and exceed your expectations. Are you a homeowner or a handyman in search of a paint sprayer for light and occasional paint works? Then, you landed on the right page because the Graco Magnum 262800 X5 Stand Airless Paint Sprayer is a light-duty sprayer designed for infrequent, interior and exterior paint projects. This sprayer weighs 18.8 pounds, has dimensions of 19.4 x 15 x 12.8 inches, comes with a 25-ft airless hose, holds a maximum pressure of 2800 PSI, renders a maximum delivery rate of 0.24 GPM, runs on 0.5 HP motor, and can be used with a maximum tip size of 0.015. Thanks to Graco’s state-of-the-art technology, users of Graco Magnum 262800 X5 airless paint sprayer can enjoy a great deal of benefits and advantages when painting. The Graco Magnum 262800 X5 airless paint sprayer renders about 13% more output than does the Magnum Project Painter Plus Sprayer. Owing to the sprayer’s brilliant engineering design, the unit weighs light, which makes it easy for the user to move the sprayer while doing light painting tasks. It also comes in small, compact, single-set packing, which makes it easy to store the unit after use. The sprayer does not require high maintenance work, and servicing of module is generally simple and easy. You can clean the gun, pump and hose by simply attaching the hose with the soapy liquid and by using the Power Flush cleaning adapter for fast cleanup. It also comes with 8-ounces of pump armor storage fluid so you can keep it in good condition. If you want value for your money, you cannot go wrong investing it in Graco Magnum 262800 X5 airless paint sprayer, which is highly reliable, durable, easy to use, efficient, and capable of delivering quality outputs and finishes. It can also be used with thick materials such as elastomeric paint so you can do a wide range of light and occasional paint works. The Graco Magnum 262800 X5 airless paint sprayer is designed only for light and occasional paint tasks. As such, it may not be the best paint sprayer for doing heavy and large-scale paint jobs. The sprayer’s easy-to-grasp knob and user-friendly operating modes make it easy for the user to adjust the pressure level and settings of the sprayer. The stainless steel piston pump of the sprayer can render a maximum delivery rate of 0.24 GPM or pump through the hose one to five gallons of paint fluid at a time directly from a container. The recommended annual usage is 125 Gallons. The Graco Magnum 262800 X5 airless paint sprayer comes with a durable and stable stand, which allows the user to work with great ease. The sprayer’s power flush mode allows for fast cleanup. Just attach the hose and flush the system using the appropriate cleansing liquid. The end of the power cord lights or glows up to indicate the sprayer’s power source. The sprayer’s built-in carrying handle allows the user to easily move from one place to another. The sprayer’s highly durable piston-pump allows it to stay in good condition for a longer period of time. The sprayer’s auto-prime feature helps reduce, if not totally eliminate, priming problems usually encountered by users. The durable stand mount keeps the unit in a stable position while the user is working. The 25-ft (7.5 m) DuraFlex airless hose that comes with the Graco Magnum 262800 X5 airless paint sprayer allows the user to reach far heights and distances when spraying so the user will not have to move too often when spraying. The flexible pick-up hose also allows for the sprayer to pump one to five gallons of paint directly from the container. Another great feature of this sprayer is that the pump and motor stops automatically when the gun trigger is released. This keeps the sprayer from overheating. The Graco Magnum 262800 X5 airless paint sprayer is ideal for homeowners and handymen who need to do occasional light paint jobs such as walls, doors, siding, fences, decks, and house interiors or exteriors. It creates light to medium coating thickness and has a recommended annual usage of up to 125 gallons or 473 liters of paint. Its light weight and compact design makes it easy for the user to work with it, clean it and to store it. If you want satisfying results that are definitely worth the money you will be spending on a sprayer, you cannot go wrong with the Graco Magnum 262800 X5 airless paint sprayer as it is equipped with everything a sprayer needs to deliver high quality results with great ease and efficiency when doing light and occasional paint jobs. If you’re looking for a spray gun brand and type that lives up to its promises and is ideal for light industrial, hobby, spot repair, base coat, or clear coat paint jobs, then Graco-Sharpe 288878 FX3000 is the gun for you. Graco-Sharpe guns are highly dependable. The 288878 FX3000, a 1.0 mm HVLP Gravity Feed Spray gun, is lightweight, compact and features a large pattern size of up to 12.5 inches. The gun can be used with nozzles ranging from 1.0 to 1.8 mm, and comes with a 600 cc aluminium cup, wrench and cleaning brush. For one to have greater appreciation of the benefits and advantages of using HVLP spray guns such as the Graco-Sharpe 288878 FX3000, it would be important to understand the limitations and disadvantages of its conventional counterparts. Understandably, conventional non-HVLP spray guns have become less and less popular among spry gun users. The high cost of material and of contemporary paints as well as the EPA limits and regulations set by local governments for the industry including wood and auto finishing markets have forced homeowners, contractors and professional painters to look for a better alternative that offers not just high transfer efficiency but are also compliant with applicable environmental laws. Such a need paved the way for the advent of high-volume, low-pressure (HVLP) spray guns such as the Graco-Sharpe 288878 FX3000 that have the following benefits and advantages not offered by the conventional non-HVLP air spray guns. Since a high volume of material is emitted at a low pressure level, more amount of paint sticks onto the surface and less paint particles escape into the atmosphere as overspray. Thus, you get higher percentage of material savings, which then translates into money savings. As discussed earlier, the ability of HVLP spray guns such as the Graco-Sharpe 288878 FX3000 to transfer the material onto the surface with a high level of efficiency, which reduces the amount of paint particles that is released into our atmosphere makes it not just a practical but also an environment-friendly alternative to the conventional non-HVLP air spray guns. With Graco-Sharpe 288878 FX3000, spray pattern is easy to control, which allows for creating an even and smooth material application that is crucial for getting a satisfying and high quality finish. The Graco-Sharpe 288878 FX3000 is a great gun for beginners. It is very simple and easy to use and to clean as it has fewer parts. Replacement parts are also readily available in case you will need them. If you want value for your money, you won’t be disappointed with the Graco-Sharpe 288878 FX3000. It offers the same or even better quality than its high end counterparts at an affordable and reasonable price. Knowing a tool’s limitations and disadvantages is just as important as knowing its benefits and advantages. This will help you weigh your options and make the right choice for your need. While the Graco-Sharpe 288878 FX3000 is highly able to keep its promises of increased transfer efficiency, satisfying quality finish, and ease of use, it comes with quite a slow outflow rate of material and takes a while to lay down paint on the surface. Thus, it may not be ideal for doing large-scale paint jobs. FX3000 definitely comes at par with high end paint guns in terms of transfer efficiency, even spraying, ease of use, ease of cleaning, and durability. With its HVLP system, paint is dispersed at a higher volume but with a much lower pressure than the traditional or conventional air spray gun. Thus, more paint ends up on your target surface and less paint ends up floating in the air making it not just an efficient but also an environment-friendly paint tool. Since it produces less overspray than its conventional counterparts, using HVLP spray guns has not just become an industry standard but is ordered by many local governments and is mandatory in several states. HVLP guns emit paint particles at almost half the rate that a conventional spray gun does so you will need to spray to the surface at a closer distance. This allows for less overspray and for more of your paint to reach the surface. The small tip size is recommended for shooting thin materials such as single-stage paints, metallics, and pearls. It also atomizes and disperses paint particles fine enough for producing clearcoats. FX3000 is said to have approximately 29 percent fewer parts than the previous Finex models. The soft texture of spray that HVLP guns are able to produce makes them ideal for applications where high level of control at the gun is needed by the user. Because of its high transfer efficiency and since it has only few parts that need to cleaned and maintained, the FX3000 offers a high level of durability, and is less prone to wear-and-tear, and repairs and replacements. In conclusion, the Graco-Sharpe 288878 FX3000 is one spray gun that can give you great value for your money, high efficiency for your material, great and satisfying paint job outputs, and a great paint job experience without making too much harm and damage to our environment. Paint Sprayer is designed mainly for maintenance purposes, and for doing medium-scale to large-scale paint job projects that need to be done on a regular basis. This sprayer is also ideal for use by DIYers, homeowners, professional painters, and property maintenance personnel as it is portable, has high capacity for repainting or refurbishing interiors and exteriors of houses, fences, barns or decks, and renders great, professional finishes. It has received high scores as well as positive reviews from experts and practitioners, and comes highly recommended by users. Using Graco Magnum (261815) Prox7 paint sprayer offers a lot of benefits and advantages, which make it a tool worth investing your money in. It has the capacity for doing large-scale paint jobs on a regular basis and with high efficiency and quality of output. It has a simple flush system, which makes it easy to clean and maintain. It has user-friendly control buttons that allow the users to easily adjust the pressure. The pump and motor stop automatically when the spray gun is released, which keeps the unit from getting damaged due to overheating. It is easy to move the unit as it has a hose that stretches up to 50 feet, and a foldable cart. The Graco Magnum 261815 ProX7 is quite weighty, has large dimensions, and has a lengthy hose, which may not be ideal for doing just a one-time, small-scale paint job projects. So what makes the Graco Magnum (261815) Prox7 Hi-Boy Airless Paint Sprayer perfect for the tasks it was made for? With a maximum delivery rating of 0.34 gallons per minute, the Graco Magnum (261815) Prox7 Hi-Boy Airless Paint Sprayer is able to pump from 1 to 5 gallon-paint containers at a time. This means high efficiency for the user and less amount of time consumed for painting large surfaces. The Graco Magnum (261815) Prox7 Hi-Boy Airless Paint Sprayer has an auto-prime feature that automatically covers the surface with special paint before the main paint is applied. Such feature helps reduce blistering problems when priming, and allows users to use their material effectively. The Graco Magnum (261815) Prox7 paint sprayer has an adjustable pressure control feature that enables users to control the pressure level and avoid releasing too much overspray. Graco Magnum (261815) Prox7 paint sprayer promises high performance capability, auto-prime and pressure control functions, easy-to-clean parts, and other great features that are perfect for accomplishing regular large projects. It is also easy to use, move and maintain, and comes at a very affordable and reasonable price. However, for you to be able to maximize the full potential and enjoy the benefits and advantages of using the Graco Magnum (261815) Prox7 paint sprayer, you should have a large-scale paint job task at hand and a need to use it on a regular basis. If you would not be using it often and you only have a small surface to cover, it would be best for you to look for a paint sprayer that is appropriate for rare usage and small-scale projects. Thus, it is important to gauge your requirements before deciding on which sprayer to purchase. Among the best types of paint sprayer that you can get available in the market is the actual Wagner 0518080 Max HVLP Sprayer. It provides durability, versatility top quality and overall performance level. The Wagner 0518080 Control Spray Max HVLP Sprayer may be the perfect solution for all your big piece of painting jobs. Top quality oil based paint can be used. This particular sprayer is really a bleeder type that will blow air continuously. Its very easy to utilize as possible spray pushing the trigger along with controlling the nozzle. It may be used with regard to painting vehicles, ceilings, fencing etc. The actual painted area may also be cleaned up while using sprayer within the reverse design. A little bit noise is complained during painting. A small nozzle is essential to control the air pressure efficiently. Some problems are noticed when observed painting the actual ceiling vertically. This Wagner 0518080 is well-designed in order to achieve excellent outcomes for the painting functions. Because from the specialized functions associated about this item, you may surely expect what you need towards work. You can simply use this particular sprayer for the painting jobs and you can also thoroughly clean it up quite easily. That’s why you may also say that it only demands low maintenance when cleansing the device. Lightweight however powerful, this useful tool creates in just moments. It includes a viscosity mug that enables you to measure the actual density from the material you are using as well as adjust the actual spray design as required. Using the Control Squirt Max, you may spray a number of different paints, primers, lacquers, as well as stains. Utilize it to perfect and fresh paint cabinets, doorway trim, as well as decks, in order to stain furnishings, woodworking tasks, and much more. In conclusion I wish to articulate that Wagner 0518080 Sprayer is an excellent invention for modern civilization. 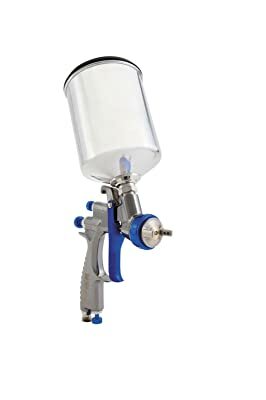 For novice painters or who wish to paint a number of things in the house, this piece of art sprayer is simply awesome. It delivers the very best in your own affordable budget and provide finest piece of art experiences. Its also now position number one on the market and the genuine manufacturers provide most priority towards the customers. Why are you waiting for? Go and get this sprayer as well as make everything colorful around you. The Wagner Power Tex is definitely an all in one run texture sprayerno individual air compressor or even air hoses required! Excellent built-in turbine using more than sufficient power to texture a whole ceiling, however it really is just designed, therefore it is ideal actually for small touch-up jobs. Additionally, since it functions Wagners Lock-n-Go Technologies, set up as well as clean up tend to be easily along with no tools needed. The Wagner Power Tex bundle consists of The Wagner Power Tex bundle consists of Wagner Power Tex One-gallon hopper three nozzles (small, moderate, as well as large) Cleansing brush Lubrication Along with Lock-n-Go Technologies, the sprayer functions fast, no-tool set up. This particular sprayers hopper changes very easily in order to add attractive texturing in order to ceilings as well as walls. No Compressor? No Issue. The award-winning Wagner Power Tex texture sprayer features the powerful built-in air turbine, which generates enough airflow in order to apply professional-looking consistency upon walls, ceilings, along with other hard surfaces. Since the turbine is actually built into the sprayer, there is certainly no air compressor or even long air hoses needed. The turbine is ranked at 120 volts, 3.7 amps, and 60 Hertz. Wagner Power Tex has brought the Member Tested and Recommended seal and the Contractor Tested as well as Recommended” seal through the famous Handyman Club of U.S.A. Financially perform the job when compared with spray cans or even hiring an expert. Clean up is extremely simple. To wash, just remember to remove the air turbine, the hopper, as well as nozzle through the spray gun. The brush is roofed; clean the parts along with comfortable, water and soap, utilizing the brush. Right after this dries; reassemble the unit with regard to storage. Texturing might be a messy task along with any kind of gear, although. Become sure in order to cover completely everything, as well as problem solved. Texturing could be a taxing job. It needs upper body strength for a fresh and great workout. It includes powerful built-in air turbine, 1-gal. Hopper, three spray nozzles, changeable flow trigger. Lastly. The Wagner 0520000 Power Tex Texture Sprayer is definitely an excellent product that may fulfill your needs and make you pleased. Do-it-yourself paint jobs are not always as fun, simple and easy as it may sound, especially if you do not have a good quality and task-appropriate tool for the job. If you are a homeowner planning to paint your interior walls, your ceilings, or your doors, fences, and decks by yourself, then what you need is a sprayer that is portable, easy to use, easy to clean and store, reliable, durable, efficient, and comes with everything that simplifies your job and delivers the kind of results that you want. What you need is the Graco 257025 Project Painter Plus. There are several advantages and benefits that Graco 257025 Project Painter Plus is able to offer in terms of efficiency, ease of use, maintenance requirement and value for money. 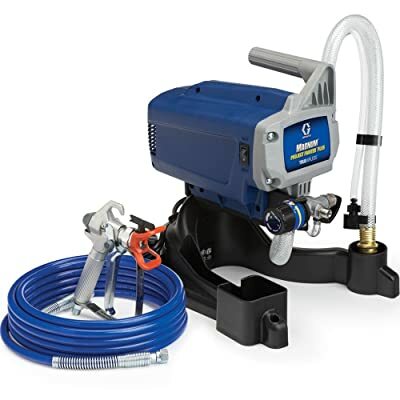 With a maximum delivery rate of 0.24 gpm (gallons per minute) (0.91 lpm), and with a pump that can directly feed through a hose from a 1-5-gallon paint container, the Graco 257025 Project Painter Plus can increase your efficiency when doing your paint job. DIYers can benefit greatly from the Graco 257025 Project Painter Plus’s light weight and compact design. It weighs only 15 pounds, and has an integrated storage system so one can easily and conveniently move and store the unit without much effort and hassle. The unit comes with 8-ounces of pump armor storage fluid and a fast clean up Power Flush cleaning system, which allows the user to keep the unit in good condition without doing too much maintenance work. Efficiency, ease of use, reliability, durability, and professional quality finish are just some of the good things offered by the Graco 257025 Project Painter Plus. If you do not want to regret spending your money on something that will not deliver your desired results, then a Graco 257025 Project Painter Plus is exactly where you need to invest your money in. The Graco 257025 Project Painter Plus is best used for DIY light to medium-scale paint tasks, where its great features and potential efficiency level can be fully maximized and utilized. If used for heavy and large-scale paint jobs, the efficiency level may not be as high as it would be for the scale of paint task it was designed and intended for. The flexible paint supply hose allows spraying directly from 1 to 5 gal containers. The pail hook allows you to connect the paint container to sprayer so you can move the container and the sprayer at the same time. The sprayer’s compact design allows for easy transportation and storage, and provides enough space for storing the spray gun, extra tips Power Flush adaptor and power cord. The sprayer’s user-friendly, adjustable pressure control allows the user to easily change and set the spray pressure to a level appropriate for the surface and the material so as to reduce or lessen overspray. The unit comes with a Power Flush Cleaning system wherein a garden hose is simply attached to the sprayer for fast cleanup. The sprayer’s power plug has a power cord end, which glows to indicate a good power source. 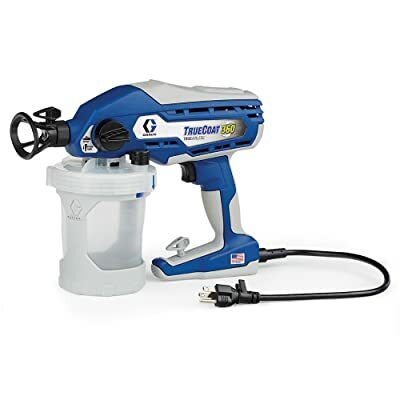 The Graco 257025 Project Painter Plus is an airless paint sprayer with which a DIYer can do light to medium paint tasks with great quality finish and high level of efficiency. Painting interiors such as walls, ceilings, or doors, and exteriors such as fences, and decks come easy with Graco 257025 Project Painter Plus’ light and compact design, durable and easy to clean parts and accessories, and low maintenance work requirement. Its user-friendly and adjustable settings give the user enough control over the sprayer’s pressure level so the user can easily change and apply the right amount of pressure that would result in less overspray but high transfer efficiency for the material. All in all, Graco 257025 Project Painter Plus has the features and capability that can aid DIYers in accomplishing their household paint tasks with such great ease and professional finish. Have not had any success finding the paint sprayer that meets your high quality standards and suits your paint job requirements down to the smallest detail? 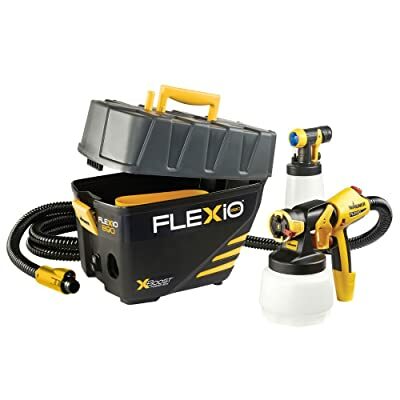 Well, do not fret just yet ‘cause there is still the Wagner 0529021 Flexio 890 HVLP Paint Sprayer Station that is sure to leave your expectations unmet no more. 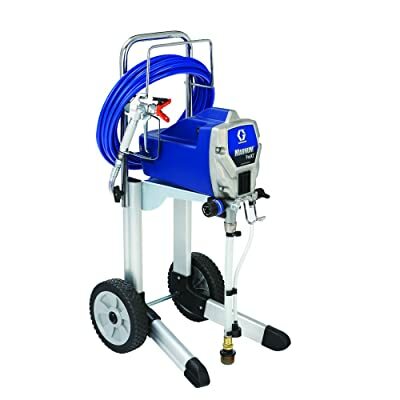 It is a portable HVLP paint sprayer that can be used for both indoor and outdoor paint jobs, features the trailblazer iSpray nozzle technology for broad surface coverage and the Detail Finish nozzle for fine finishing, as well as the X-boost Power Box, which conveniently houses the sprayer parts and turbine. The paint sprayer definitely lies on top of the line as it has proven to be another great tool from Wagner, one of the top and trusted names in the paint sprayer manufacturing industry, which offers flexibility, convenience, efficiency, and quality. Flexibility is definitely an advantage that individuals with paint job missions are looking for in a paint sprayer. 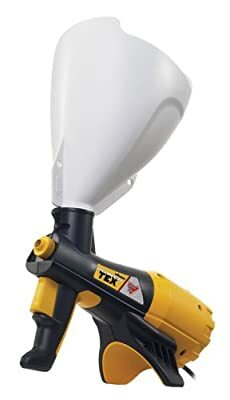 Fortunately, this paint sprayer is incredibly flexible as it can be used for interior and exterior paint jobs, and can spray thick and unthinned materials. This sprayer, which comes with an iSpray nozzle and Detail Finish nozzle, is also great for covering wide surfaces, and for creating fine finishes. 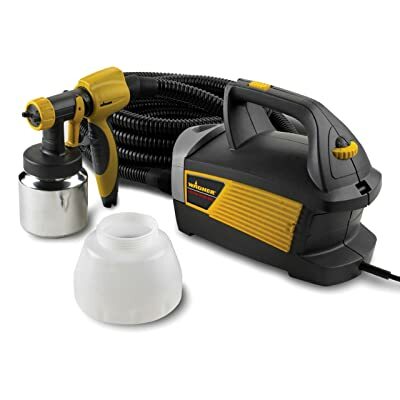 The Wagner 0529021 Flexio 890’s X-Boost Power Box houses the iSpray and Detail Finish nozzles, the 11.5 foot hose and the handle with integrated power dial for easy storage. It also keeps the weight of the unit on the floor so the user can work and move conveniently without putting too much weight and strain on the user’s arms and hands. This paint sprayer’s X-Boost Turbine has adjustable control features, and generates unparalleled spraying power that allows for full coverage with high transfer efficiency and low overspray. Thus, you’ll be able to work with high efficiency, as well as save a good deal of time, money and energy. If you are someone who demands superior quality and durability for every centavo you spend on a tool, then this paint sprayer’s highly durable materials, excellent design and engineering would definitely be worth your every penny. Some few defects attributed to manufacturing errors have been quickly resolved and replaced so it is definitely safe to say that the Wagner 0529021 Flexio 890 HVLP Paint Sprayer Station continue to live up to high standards as expected from every product carrying Wagner’s name. With a maximum pressure of 3 psi and a flow rate of 8.4 gallons per hour, the Wagner 0529021 Flexio 890 HVLP Paint Sprayer Station can easily cover with unthinned latex paints an 80-square meter area in less than five minutes. The paint sprayer’s patented iSpray nozzle trademark has no wearable parts so it can be used for a long time. It is also ideal for covering broad, interior or exterior surfaces with unthinned thick materials including paint and primer. For a fine finish and smooth surface when doing indoor or outdoor paint projects, use the Wagner 0529021 Flexio 890 HVLP Paint Sprayer Station’s Detail Finish nozzle. If you’d need to change the spray pattern, material flow, and air power, you need not go to the base as you can easily adjust the settings with its all-in-one handle. Detaching the nozzle from the gun when changing your material or cleaning the sprayer can be easily done with Wagner 0529021 Flexio 890’s Lock-n-Go feature. Another great feature that this paint sprayer can boast of is that it comes with an X-boost power box, which houses the turbine and is designed to fit the hose/handle and two nozzle and cup assemblies for safe and proper storage. It also keeps the weight of the turbine on the ground so you can work with less strain and more comfort. Wagner 0529021 Flexio 890 HVLP Paint Sprayer Station runs on its X-Boost Turbine, which allows for adequately powered control, coverage, and material transfer and reduced overspray levels. The unit also has easy-to-fill cups with directional suction tube so you can finish your projects fast. With Wagner 0529021 Flexio 890 HVLP Paint Sprayer Station, you can definitely expect great results for your indoor or outdoor paint projects. If you have a broad surface to take on and would be painting for a long time, you would benefit largely from this tool’s low weight, iSpray nozzle, easily adjustable control triggers, and high power and delivery rate. With its Detail Finish nozzle, you can also simply create a fine, professional-looking, and smooth finish. For a fairly affordable price, you get to take advantage of all of its great features. You’ll also be sure to meet the high level of flexibility, convenience, efficiency, and quality that you can expect from any product made by Wagner. Tools are meant to make our jobs fast and simple, and that’s exactly what Graco 16Y385 TrueCoat 360 is all about. If you want to get an easy fine finish in no time, then you cannot go wrong with Graco 16Y385 TrueCoat 360, which weighs four-pounds, sprays a full 360 in any direction, and features the industry’s first FlexLiner paint bag technology. All you’ll have to do for a quick and hassle-free DIY indoor or outdoor paint job and staining project is fill, squeeze and spray. Below are the reasons why Graco 16Y385 TrueCoat 360 remains among professionals’ and DIYers’ top choices for interior and exterior paint jobs. DIYers are sure to love the Graco 16Y385 TrueCoat 360 because it’s so easy to set up and use. Just fill the FlexLiner Paint Bag with paint, squeeze and spray. With no need for suction tubes, and as the name suggests, this sprayer allows its users to conveniently spray a full 360⁰ in any direction without losing prime. Graco 16Y385 TrueCoat 360 sprays a wide variety of paint and stains with no need for thinning. It works with latex, oil-based paints, acrylics, and clears. The 12-inch & 4-inch RAC Spray Tips allows users to make either wide or narrow spray patterns depending on their need and preference. Once you are done painting, you may opt to either reuse the bag or dispose of it. This sprayer weighs only 3.5 lbs so you can work for long hours without putting too much train or tension on your arms. With Graco 16Y385 TrueCoat 360, even first-time DIYers can paint like a pro and create smooth and fine interior and exterior paint job finishes. While the Graco 16Y385 TrueCoat 360 may be the ideal paint spryer for small to medium-scale interior or exterior paint projects, one may find it inconvenient to use this sprayer for painting large surfaces as it requires the paint bag to be refilled from time to time unlike sprayers that are designed to draw paint directly from large containers. The Graco 16Y385 TrueCoat 360 is packed with the following features that make it your perfect partner for a fast, simple and easy paint job task. This industry-first technology eliminates the use of suction tubes and lets you spray a full 360⁰ with ease practically in any direction. Simply fill up the bag with paint, press or squeeze to spray, then dispose off or reuse the bag in your next paint job project. The Graco 16Y385 TrueCoat 360 is equipped with a durable, high-pressure tungsten carbide piston pump that can spray a wide variety of thin and thick materials from paints and stains with no thinning required. Graco Truecoat 360’s VacuValve Technology creates a vacuum that allows its users to spray in any direction without losing prime. The unit comes with 4-inch & 12-inch spray patterns (.015 hole size) that can make narrow or wide spray patterns so users can have greater flexibility. The tips are reversible so clogs and buildups may be easily removed from the tips without the need to disassemble the gun. The Graco 16Y385 TrueCoat 360’s dual speed control enables precise material delivery so less over spray is produced. The Truecoat 360 is so easy to clean. Once you are done painting, just fill the FlexLiner bag with water or mineral spirits, shake the sprayer, then spray the water out into a bucket or a container. You may also opt dispose of the used FlexLiner bag or keep and recycle it for your next paint job project. In summary, it would definitely be fair to say that Graco 16Y385 TrueCoat 360 is the ideal paint sprayer for homeowners, DIY hobbyists, and professionals who have small paint job projects at hand, and want to have a professional-looking fine finish as quickly and as simply as possible. With its industry-first FlexLiner paint bag system, high-pressure piston pump, VacuValve technology, Reverse-A-Clean (RAC) Spray Tips, dual speed control, and 3-step cleanup procedure, spraying like a pro just cannot get any more simple and easy than when you use the Graco 16Y385 TrueCoat 360. Just fill the bag, squeeze out air to create a vacuum, and spray in any direction, even hard-to-reach corners, with much ease and flexibility. Using Graco 16Y385 TrueCoat 360 also offers a lot of advantages. For one, it is lightweight and very simple and easy to use and clean. It sprays a full 360⁰ in any direction without losing prime and works with thin and thick materials and sprays paints and stains with no thinning required. It also comes with spray tips that can make narrow and wide spray patterns, which allows for achieving a great professional finish. Based on the reviews, Graco 16Y385 TrueCoat 360, fares high when rated for its quality, durability, ease of use, and efficiency. These are professionally designed sprayers mainly aimed at responding to the inefficiencies experienced with conventional sprayers. The HVLP can be said to be the best paint sprayers currently available in the market as they are known to give excellent results. Their popularity is comes from the ability to combine high volume of air and low pressure. This gives 80% spray accuracy which is surely incredible. The combination of high volume and low pressure gives a smooth and fine coating that is not only accurate but also evenly distributed. These amazing sprayers feature paint flow and airflow settings alongside an adjustable spray fan. These features offer great control thus can be used by anyone who needs to do their painting job immediately. You will however need to know that they are a bit slow in their operation. With this home paint sprayer, you need to be very careful about the pressure. Remember these are low pressure sprayers and this must be maintained all the time. Increasing the pressure may ruin the quality of spray leaving the nozzle. These are the paint sprayers that work perfectly for huge projects where overspray is the least of concerns. They are normally powered by a gas motor, electric motor or a hydraulic motor. You can also find some which are powered by air compression. These airless sprayers are the best gadgets to have if you need your job done in a short time. They are renowned for their brute power as they operate under high pressure. Their use enables you to create a uniform thick coating in a single spray eliminating the need to make multiple coats. The airless sprayer will always serve as the best paint sprayer for home use as it is very effective in penetrating uneven surfaces and hard to reach cracks. The coats they deliver adhere extremely well thus less painting in the long run. When using the airless sprayers, you can be sure of having high pressure. This being the case, the pressure regulator should always be set to the required standard. This is to avoid excessive pressure which can result to wastage of paint. Pressure gauge measures the pressure inside the compressor ensuring that constant pressure is maintained. These sprayers are not as complicated as the modern sprayers. This makes it easy to understand how they work and what each feature will do for you. Most of your attention should be drawn to the air compressor, trigger, nozzle and the basin which are the main features in the sprayer. Once the basin is filled up with paint, you will only need to have the conventional sprayer hooked to a power source to get started. Speed and accessibility. The use of a sprayer allows you to paint faster than you would if a brush or roller was used. This is because you do not need to keep running the sprayer over the same place as the tiny paint particles emitted from the sprayer ensure a quick and complete coverage. These sprayers will work perfectly for you in corners and nooks that would be hard to paint using a brush. Even coating. It is quite hard to achieve a smooth finish with a brush or a roller. This makes a paint sprayer a great tool to have as it gives a fine mist that envelops the surface fully. The sprayers give a great shade while working on furniture, window frames and stairs and even on walls and still give a smooth coating. Variety. Paint sprayers come in different types and sizes making them a perfect fit for homeowners, professional painters and contractors. Depending on the project you want to handle, you can choose from the wide range of home paint sprayers that will always be available to you. This eliminates the limitations you used to experience while using rollers. The paint sprayers are also unique in their design and perform differently. As you will see in the table below, most of the benefits are the same but every new development comes with an added advantage. – Reduced overspray thus reduced wastage of paint -Speed and efficiency – No compression. Using the paint sprays at home is very common and this makes it necessary to know the health and safety measures that need to be adopted. Ventilation is very vital when it comes to the use of any paint sprayer. As you paint, the tiny particles are pushed into the surrounding air and can be fatal if inhaled. This makes it necessary to have air flowing freely into the room and avenues to enable the air flow out should also be provided. Have all the windows and doors open when handling any painting job. It is ok to have the sprayer’s pressure set at its maximum while doing outdoor projects. This is however not the case when it comes to indoor projects. The particles used to handle outdoor projects are a bit more durable than those used indoors. This being the case, high pressure indoors can indent indoor walls giving poor results. Make a point of testing the pressure before beginning any spraying task. Ladders cause a great safety hazard regardless of their location. The danger is more pronounced if the ladders are indoors. It can be very dangerous to try to use a sprayer whose hose does not stretch the whole length. This is because your attention will not be at the sprayer in most cases and this can result in accidents. Do not try to prop the sprayer. Instead, look for a sprayer with a longer hose. This is to avoid injuring yourself. More to this, do not lean too much while on the ladder. It is advisable that you move the ladder if there is an area that you cannot reach. The interior of a room has controlled air flow. This means that the use of any sprayer will contaminate the little available air. To ensure that you are not inhaling these paint particles, it is advisable that you have a mask on all the time. Wearing protective clothing such as aprons, gloves and helmets is also important. Try as much as possible to avoid any paint contact with your skin. This will not only keep your skin free from any infections but will also make it easy for you to clean up. The paint used in most painting work is known to affect the eyes. To ensure that your eyes are properly protected while using a paint sprayer, always have your goggles ready. These will allow you to see where you are painting while protecting your eyes from the harmful particles. Question 1 : What cleaner is the best to use on my airless cleaner? Answer: It is advisable that you use the thinner that you used to thin the paint to clean the sprayer. If you are using latex, water would be the best cleaner. Mineral spirits work best for oil-based paints while lacquer thinner works perfectly for lacquer. Question 2: How often should the sprayer be cleaned? Answer: Your sprayer needs to be cleaned after every use. Take your time to clean every part of the sprayer including the filters, gun, tip and the housing. This will give the sprayer a longer life. Question 3: How should I clean my spray tips? Answer: The best way to clean your best paint sprayer tip is starting the cleaning process when the tip is still in the sprayer. After this, you can clean the tip in a bucket or other container using a stiff bristled nylon brush. The same thinner should be used to clean the tip. Finally, put the tip back on the sprayer and use the high pressure blast to do the final clean up. Question 4: How do you tell when your tip is worn out? Answer: Spray tips normally start out in an oval pattern as you spray. This oval shape changes gradually into a circle as the tip wears out. You can also know when the tip is worn out by checking the finger and tail effects. Question 5: What is a whip hose? Answer: This is a short and usually narrower hose that is used between the regular hose and the paint sprayer. This is very important as it makes the sprayer easy to move around. This flexibility allows you to paint a wider area without the need to move the entire system. This reduces the time spent while helping you complete the painting task with little fatigue. Question 6: Why should you have a shorter hose? Answer: A long hose is very cool while painting a huge area but it can also be a burden when painting close proximity. It is for this reason that you need to have a shorter hose. Additionally, priming a full size pump using a 50 foot hose can be very costly as it consumes more material. By using a shorter hose with a smaller diameter, you can reduce the material used. You can reduce it further by using a hopper especially when spraying a single gallon or less. Question 7: What is the difference between the black gun filters and blue gun filters? Answer: If you are focusing your attention on the Graco gun filters, the difference in the colors comes in as the black one is a 60 mesh while the blue is the 100 mesh. The 100 mesh sprayers are mainly used for fine finishes such as cabinetry, lacquers while the 60 mesh sprayers are used for normal spray works, normally with latex paints. Question 8: Is there a difference between a 2 finger trigger and a 4 finger trigger? Answer: The difference cannot be seen in the spraying process or the quality of spray given by the spray. This is purely a preference issue intended to suit different people and their needs. The 2 fingered trigger gun is commonly used by contractors while the 4 fingered trigger is common among homeowners. Question 9: What makes the fuse in the sprayer blow? Answer: It is not common to find that the sprayer fuse has blown. However, this does not mean that it cannot blow. The blowing of a fuse can be caused by a big drop or spike in power. A worn out electrical outlet can also make the fuse blow. Question 10:What does the gallons per year rating displayed on the sprayer mean? Answer: This is a rating used to guide you while picking a sprayer. If you intend to handle huge projects per year, you will need a sprayer that has a high rating. For instance, if you intend to paint around 25 houses per year, a sprayer with 125 gallons per year rating would not be appropriate. You need to know that the sprayer does not stop working after this limit is reached but going beyond the limit overworks the motor which can affect the quality of coat given. The crucial step in buying the best paint sprayer is determining which sprayer will work best for you. Only after determining this should you start weighing the buying options available to you. This way, you will avoid getting lost in the buying process thus avoiding being tricked by retailers. After you have settled on the sprayer that works for you, the search can begin. Well, checking the local stores would sound like the easiest way. However, do not limit yourself to the local stores. There are numerous online stores that offer a wide variety of paint sprayers. With online stores, you can easily move from one store to the other without leaving your home. This saves a lot of time while giving you an opportunity to explore the different brands of sprayers available to you. This is not to mention that you can get great discounts from these online stores. This ranks among the most trusted names in the painting industries in the United States. Its popularity can be attributed to the amazing products offered such as Wagner 518080 Control Spray Max, Wagner 0520000 Power Tex Texture Sprayer, Wagner flexio 590 and the Wagner double duty paint sprayers. Graco offers great paint spraying equipment with the popular brands being the Graco 16Y385 TrueCoat 360 , Graco 16N659 TrueCoat PlusII, Graco 257025 Project Painter Plus, Graco Magnum 262800 X5, Graco Magnum 261815 Pro X7. These sprayers are ideal for residential as well as commercial projects making them very reliable. There are lots of cheap paint sprayers available in the market today, but it is not recommend purchase a sprayer with the least price when you are just starting. The quality and price have reciprocal relationship. Everyone wants to save their money, but it is not a best decision to go too cheap and finally be disappointed. There are lots of costly Paint Sprayers on the market. For normal home painting works you don’t need a costly sprayer. But remember that, some of the cheap paint sprayer are made poorly and may do not work properly. So, be sincere, to choose your best paint sprayer. It’s cheaper to buy a paint sprayer online like Amazon.com. They also sometimes offer discounts as well as free shipping. Furthermore, if they are out of state, you don’t pay tax on online purchase. Getting the best paint sprayers can drastically change how your painting job is handled by increasing the speed and quality. There are numerous types of sprayers and making the right decision is very important. This is an investment that needs to be handled with care ensuring that the sprayer you are buying will last for as long as possible. it should be able to cover your entire project without demanding replacement. A painting sprayer will only be the right fit for your job if it offers efficiency and value for money. Weigh between the Conventional sprayers, HVLP paint sprayers, airless sprayers and the Cup sprayers to determine what will work best for you. While one sprayer is strong at one point, the other is strong at another and determining your needs first will help you know which sprayer is strongest in your field of interest. One thing you can be sure of is that there will always be a paint sprayer that works for you. You only need to determine your needs and make the move to get the sprayer that will serve you best.